Seattle Hill Road closure information. Image courtesy of Snohomish County. Snohomish County’s Public Works Department began the multi-year Seattle Hill Road improvement project on April 10, 2017. Traffic has been briefly delayed during construction while flaggers have been directing traffic along sections of the road between 132nd Street SE and 35th Avenue SE. A full Seattle Hill Road closure at 36th Drive SE will occur from 10:00 am on Friday, June 23rd, until 4:30 am on Monday, June 26th. The detour route for most traffic is 35th Avenue SE and 132nd Street SE. Two more full-road closures will be necessary before the project’s scheduled summer 2018 completion. 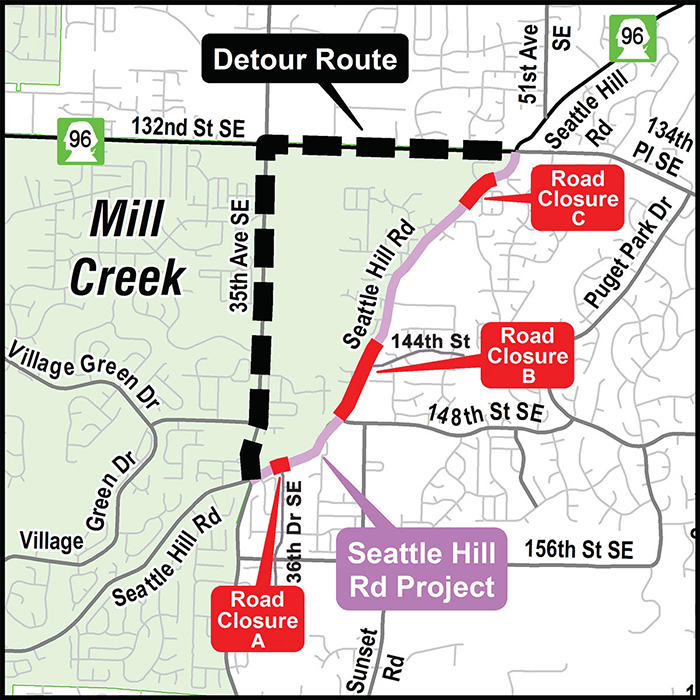 The second full Seattle Hill Road closure north will be from 148th Street SE to just past 144th Street SE will last five-days and is tentatively scheduled for mid-July. The third full Seattle Hill Road closure in the 4700 block near 132nd Street SE is tentatively scheduled for spring 2018.